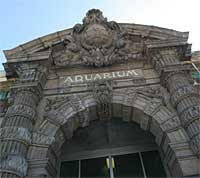 It seems likely that by this time next month, the Belle Isle Aquarium will be closed. With a $230 million deficit looming, Detroit city administrators are looking to cut costs, with major cuts to city bus routes and large-scale layoffs first on the list � and a 101-year-old aquarium facing declining attendance and needing major repairs can�t be far behind. Kathy Smith takes what may be a last look at a finned friend. Detroit Zoological Institute Director Ron Kagan says he was originally told he�d have to pare $2.2 million from the budget of the institution, which administers the zoo. Though the city now only demands a reduction of about $1 million, the aquarium � included in the zoo�s budget � was a natural target for the cut, though Kagan wouldn�t say whether city or zoo officials initially proposed putting the Belle Isle Aquarium on the chopping block. A report released by the institute says attendance has plummeted from 113,000 in 1995 to 56,000 in 2004. With about $489,000 in operating expenses, the aquarium only brought in about $155,000 last year, according to the city budget. But Kagan says falling attendance isn�t the aquarium�s biggest problem. �No matter who has it, it needs a lot more money,� Kagan says. Kagan says the city spent about $600,000 three years ago fixing problems with the aquarium�s floor, and that the aquarium still needs extensive work to remain safe for humans or animals. He adds that there are no assessments of what it would cost to bring the building up to date. That, say Friends of the Belle Isle Aquarium, is exactly why the aquarium should be saved. Kagan says plans to save or revitalize the existing aquarium aren�t practical, but that he hopes the building could be used as a museum in the future. He advocates the construction of a new, state-of-the-art aquarium on Detroit�s riverfront, though no funding has been secured for such a project. �What a new aquarium will do is generate $100 million of economic impact each year to the city. There are not many things that can do that,� Kagan says. FOBIA members, motivated by a projected closing date in early March, are desperately trying to keep the facility�s doors open and its collection intact, because once the fish collection is dismantled, says FOBIA leader Stephen Goodfellow, it�s all over. Kagan says the aquarium�s collection � which includes endangered fish species, some of which are extinct in the wild � can be placed at other zoos and aquariums. Goodfellow, who runs the Web site for FOBIA (belleisleaquarium.org), says he knows that the aquarium needs a plan for the future. But his organization�s first priority is to stop the closure. At a meeting last week, FOBIA members brainstormed about ways to fund the aquarium. Corporate sponsorship and volunteer efforts topped the list. Almost as popular as proposing potential means of keeping the aquarium open are suggesting the causes for its decline. Members have discussed everything from Kagan having a personal vendetta against the aquarium to city plans to make Belle Isle into a high-end condo development. Goodfellow says members are prepared to take their case to the City Council, the mayor�s office and the Michigan Legislature, if that�s what it takes to keep the aquarium from being shuttered. Recent cuts in state funding to the Zoological Institute have also hurt the aquarium. The zoo, including the Belle Isle facilities, has an operating budget of about $11 million, Kagan says. About $600,000 comes from the state, and the rest is made up of city support and earned revenues from admissions and parking. The state funding has been cut drastically in the last year. The Detroit Zoological Society, from which Kagan was recently dismissed as CEO, raises funds for the Zoological Institute. Kagan says he�ll stay with the Society as a consultant, his original role with the group. Society chairwoman Ruth Glancy declined to be interviewed, saying she preferred Zoological Institute officials to discuss all topics relating to the aquarium closure. The aquarium isn�t the only victim in the zoo system, though it�s the hardest hit. A total of 15 positions will be eliminated from the zoo budget, Kagan says. He wasn�t sure how many of the aquarium�s six employees would be reassigned to other jobs in the zoo and how many would be laid off. To make up the rest of the shortfall, Kagan says, the zoo is introducing a new merchandise line that�s expected to bring in about $350,000 in revenue in the next year. But that�s not an option for the aquarium, according to a statement released by the zoo, which says the size and layout of the aquarium make the addition of merchandise or concessions impractical. The problems with the aquarium are symptomatic of larger problems with Belle Isle, and with many more city facilities, says Jason Booza, of Wayne State�s Center for Urban Studies. �It�s the same problem the Police Department is having � pumping money into facilities so old that you�re wasting money trying to keep them afloat,� Booza says. Options could include turning the island over to the Huron-Clinton Metropolitan Authority or charging a user fee for entrance to Belle Isle.